It has been said that Ottawa is the city that fun forgot – a cliché if there was one. However, if you suppose that that statement is true, then consider the state of the Ottawa Valley. I grew up in the small town of Barry’s Bay, Ontario, which is literally right next door to the middle of nowhere – Algonquin Provincial Park. As a youth growing up there, I can tell you that there wasn’t all that much happening. There was a ski hill, which obviously meant that if you wanted something to do during the winters, you skied. If you were a jock, you played in one of the after-school sports at Madawaska Valley District High School (MVDHS). But if you weren’t a jock, there wasn’t all that much you could gravitate towards. Sure, there were house parties to go to every now and then, but I was pretty straight-edge: I didn’t touch a drop of alcohol until my 19th birthday. So those parties, for me, were often rather middling at best. However, music geeks such as me did have an underground network of friends and acquaintances that provided mixtapes or CDs for you to record on your own. And, in the final year of my studies at MVDHS, something happened. A local country-rock band emerged: Fireweed. And they had a CD to shill! Drinking Man was a source of salvation. It gave you concerts to go to, and a reason to be proud of the area you grew up in. Fireweed – which has since changed their name to The Fireweed Company – remains an incredibly popular band in the Madawaska Valley. Their concerts routinely pull in 800 people in an area where only a few thousand live. Consider that for a moment if you’re an Ottawa band. Wouldn’t you love to have 800 people show up to your gigs? In that sense, Fireweed was and is one of the most enduring and well-liked groups in the Ottawa region. Not everything was all wine and roses, though. As is the case with many Valley bands, the group had its issues cracking the Ottawa market. I interviewed the band extensively during the mid-90s and, on one occasion, while sitting down with the outfit for a feature in Carleton University’s student newspaper, the Charlatan, in September 1995, guitarist and backing vocalist Steve Gutoskie lamented the fact that Fireweed just wasn’t getting any respect in O-town. And play the group has throughout nearly 25 years. 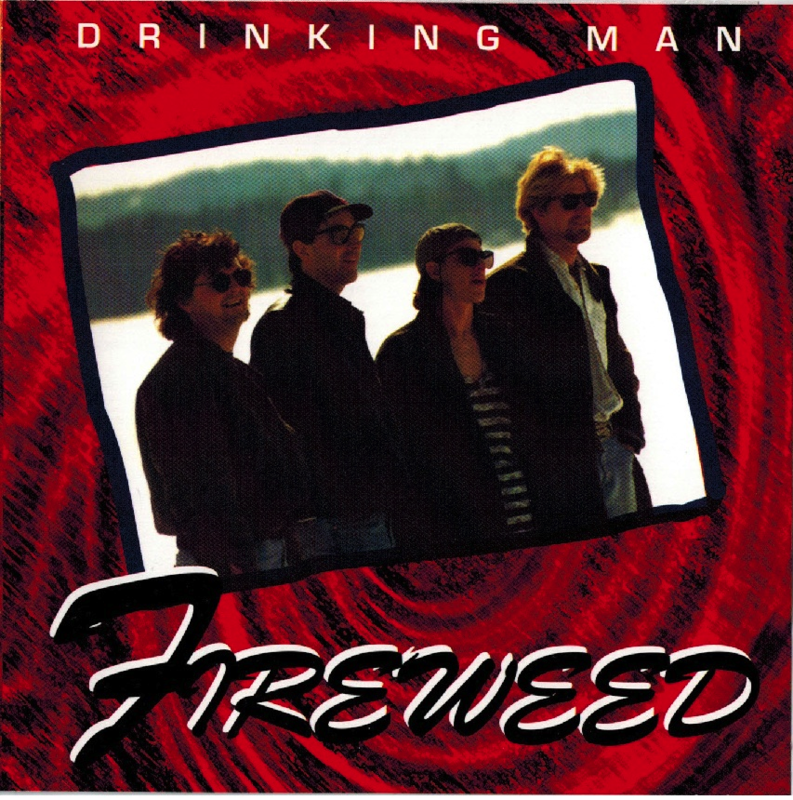 Formed in 1992 in Killaloe, Ontario, Fireweed centers around the slice-of-life lyrics of singer and rhythm guitarist Jayson Bradshaw and the fiery lead guitar attack of Gutoskie. I had the pleasure of seeing Fireweed live on many occasions, and I can tell you that they are an incendiary group: Gutoskie has been known to burn the barn doors down on a cover of Tom Petty’s “American Girl”. The key to appreciating Drinking Man, which was made in a marathon 36-hour recording session at Toronto’s Metalworks studio and mastered by Peter Moore, who had produced the Cowboy Junkies, is entering the album through the lyrics. Bradshaw has an uncanny eye for detail in portraying the lives of characters that live in small villages. “Well, I can’t stand this town no more / Time to run from my conscience, in the morning it’s no more / Time to run and hide – leave this town behind,” Bradshaw sings on “Sore Conscience”. As to his lyrical genesis, Bradshaw also explained, “If you watch the news, you can find a story anywhere really. Or watch your next door neighbours sometimes … .” Drinking Man remains a key album of the Ottawa Valley, just as important as anything recorded by folk group the Wilno Express. It was a successful album for the band: a year after its release, it had gone on to sell 850 copies (again, local bands may salivate at that sales figure). While the record is now sadly out of print, the band members still get asked about it on the streets of their respective towns (the group is now based in Combermere, Pembroke and Wilno). However, you can listen to the record for free on the CBC Radio 3 website. The group, which has undergone some personnel changes and the slight name change (though Bradshaw and Gutoskie still remain), has since gone on to release a sophomore record, 2007’s As long as you know … , which is arguably tighter and more focused. The Fireweed Company has also released a video for a tune that has yet to show up on an album for “The Philosophical Song”. Definitely, the Fireweed Company is still going strong, and Drinking Man remains a testament to forging one’s own path in a region where there isn’t all that much to do, so you might as well make your own entertainment. That the album still sounds fresh and fundamental, some 20 years later, shows just how essential a record it is. The next time you’re in the Valley, and these guys are playing a show, certainly do try to check them out. You’ll be in for a very, very good time. Until then, we thankfully have their recorded output to tide us over, especially for those of us simply looking for a good time to be had in the comfort of your own home. Zachary Houle is the Canadian Music Editor for PopMatters.com, a Chicago-based webzine that attract 1.3 million unique visitors globally each month. He also reviews books for bookwookie.ca. In addition to his music and book writing, he has had freelance journalism published in SPIN, the Ottawa Citizen, the National Post and Canadian Business. He also dabbles in fiction and poetry, and his work here has been published in literary magazines in Canada, the US and the UK. He was a recipient of an emerging artist grant from the City of Ottawa, and was nominated for a US Pushcart Prize for his work. I’ve known most of the group for many many years I too grew up in Barry’s Bay and am also Steve Gutoskies 1st cousin. I have to say I have been privileged to hear these guys on stage and just playing around. They are not only a great band but great guys with great big country hearts. Saw them live when I was 13, love them! These guys should have been all over the map!!! !